The 7 quality tools were first conceptualized by Kaoru Ishikawa, a professor of engineering at the University of Tokyo. They can be used for controlling and managing quality in any organization. The 7 basic quality tools are, essentially, graphical techniques used to identify & fix issues related to product or process quality. 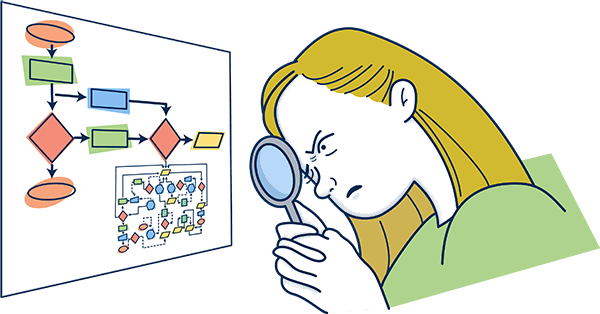 Flow charts: Flow charts are one of the best process improvement tools you can use to analyze a series of events. They map out these events to illustrate a complex process in order to find any commonalities among the events. They’re also one of the most common methods of creating a workflow diagram. Flow charts can be used in any field to break down complex processes in a way that is easy to understand. Then, you can go through the business processes one by one, identifying areas for improvement. Histogram: A histogram is a chart with different columns. These columns represent the distribution by the mean. If the histogram is normal then the graph will have a bell-shaped curve. If it is abnormal, it can take different shapes based on the condition of the distribution. Histograms are used to measure one thing against another and should always have a minimum of two variables. Cause-and-effect Diagram (also known as Fishbone diagram): Cause-and-effect diagrams can be used to understand the root causes of business problems. Because businesses face problems daily, it is necessary to understand the root of the problem so you can solve it effectively. Check Sheet: A check sheet is a basic tool that gathers and organizes data to evaluate quality. This can be done with an Excel spreadsheet so you can analyze the information gathered in a graph. Scatter Diagram: Scatter diagrams are the best way to represent the value of two different variables. They present the relationship between the different variables and illustrate the results on a Cartesian plane. Then further analysis can be done on the values. Control Charts: A control chart is a good tool for monitoring performance and can be used to monitor any process that relates to the function of an organization. These charts allow you to identify the stability and predictability of the process and identify common causes of variation. Pareto Charts: Pareto charts are charts that contain bars and a line graph. The values are shown in descending order by bars and the total is represented by the line. They can be used to identify a set of priorities so you can determine what parameters have the biggest impact on the specific area of concern. Looking to streamline or automate your business or manufacturing processes? Tallyfy offers an easy solution for your workflow automation needs. So, why don’t you give it a free try?